A consulting designer in audio is an interesting occupation. Some companies "design" everything themselves while in reality it is quite the opposite. Some companies have publicly acknowledged my design contributions. A few of them will be noted below. When I first started to work with Nathan Funk he had a decent line of subwoofers as the mainstay of his offerings. I helped him design and refine many of the components of his subwoofer systems. The current size of enclosure and the size of woofer in those enclosures has been visited by the brick wall of physics. We produced the greatest possible SPL from that particular size of enclosure. I designed the loudspeakers he currently sells in one form or another. The 8.7P design information was not made available before my termination of design work for Nathan. Design means more than simply the supply a driver suite, More than the basic enclosure calculations, Design is a comprehensive assembly of parts that work through optimal box sizes and driver locations. Much time is spent voicing the crossovers for the passive designs. In fact that part needs attention as the passive crossovers were a partnership between myself and Al Wooley a gifted man in his own right in terms of loudspeaker design. For Nathan I put together a suite of pro sound drivers that gave us the attributes of highly dynamic response and very low distortion. We turned to FaitalPro and used their woofers. Akip Labs provided the large format planars. This allowed us a degree of freedom from lower powered less efficient design concepts. From the outset I suggested going active as that allows a designer to create a system. One that meets the design goals right out of the box. My design goals are simple. Musical reality! I come from a very musical background and have played most of the brass section. Played in large groups and small ensembles. My specialty was the French Horn and Trumpet. I regularly review music and have a large carefully groomed collection of CD's. This back ground knowledge is essential to create as close to live reproduction as is possible. My reference is live un-amplified, un-engineered music. The goal is reproducing the dynamics and clarity of line that we hear when playing or listening to the real thing. On the industrial design side of things I helped simplify the plate amplifier design by taking a multiple part assembly and making it into a single unit. 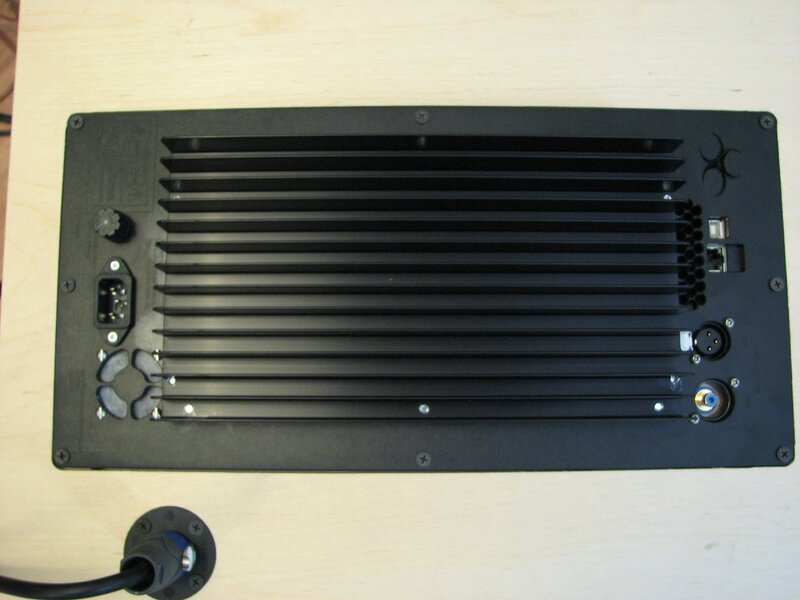 A one part heat sink plate design that allowed for both simplification in assembly procedures and cost savings. We sourced the plate heatsinks from Heatsink USA. They are a great little company that produces a superb product at a fair price. 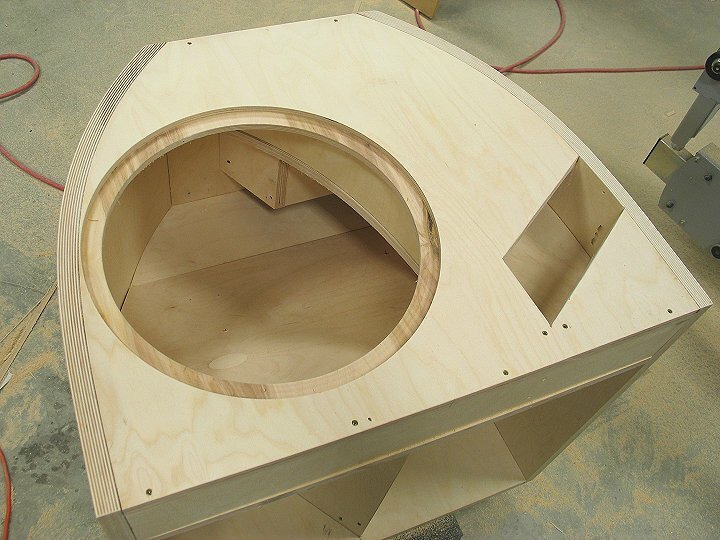 The looks of a loudspeaker cabinet are pretty important. Real wood veneering of Funk Audio's cabinet work was refined from an iron on method of dubious certainty to a vacuum veneering application method that I first used in 1994 and spent weeks on the phone tutoring Master Funk on how it goes. He learned well! Finishing quality was brought up to industry standards by the suggestion of some proper value added finishing options. There is specifically formulated lacquer for polishing and Nathan has made great use of that suggestion. Beautiful work. The distinctive front plates were a design enhancement I made meant to provide two things. A unity of frontal appearance and a concealing of the driver baskets and the ugly front grill of the planar mid tweeter that we used. That work is the product o Jordy Wallace of Focus Machining and Design. The subwoofer drivers that are his bread and butter were optimized through enhancements made in the cooling system and distribution of the magnets in motor assembly. Nathan is a careful and competent assembler of the drivers and uses great methods for his driver assembly. 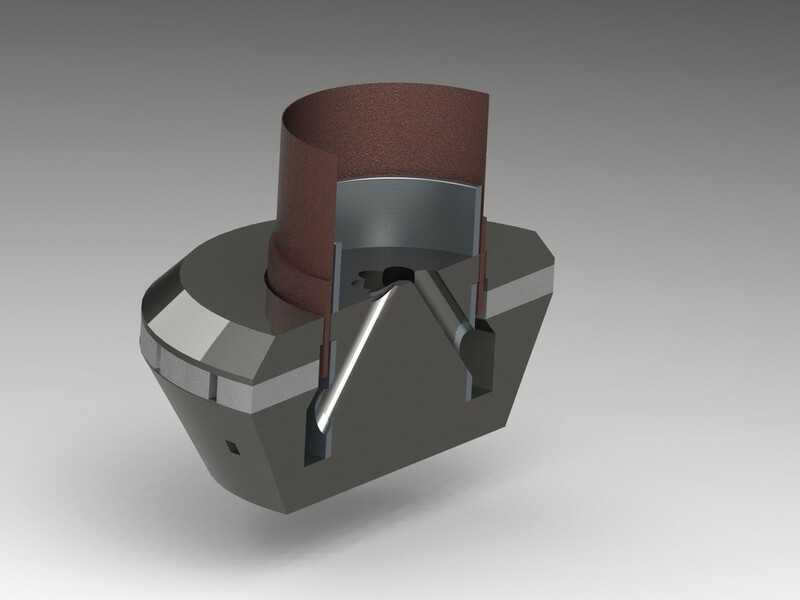 Nathan did the voice coil design and the CAD work. I provided my connections in the driver parts business to get Nathan some very high quality spiders from Hakken. 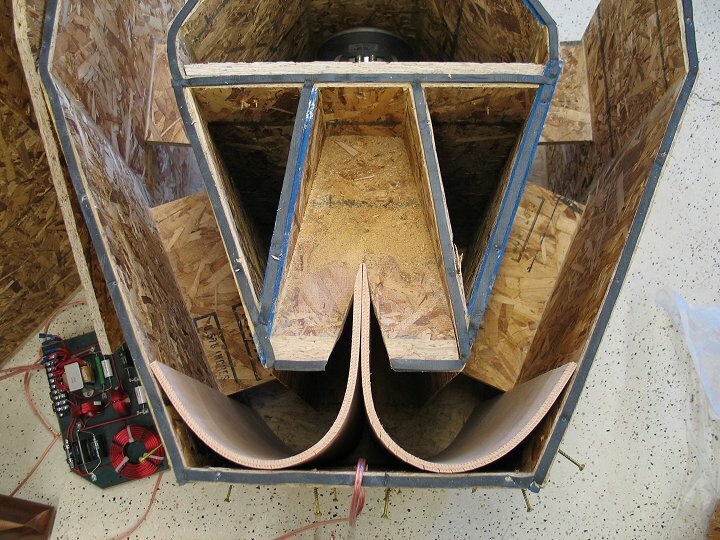 Voice Coils are a quality product made by Precision Econowind in Florida. Through one of my Pro-Sound clients Jeff Ostler I set Nathan up with amplifiers modules from PASCAL Audio. Some of the best available anywhere regardless of price. 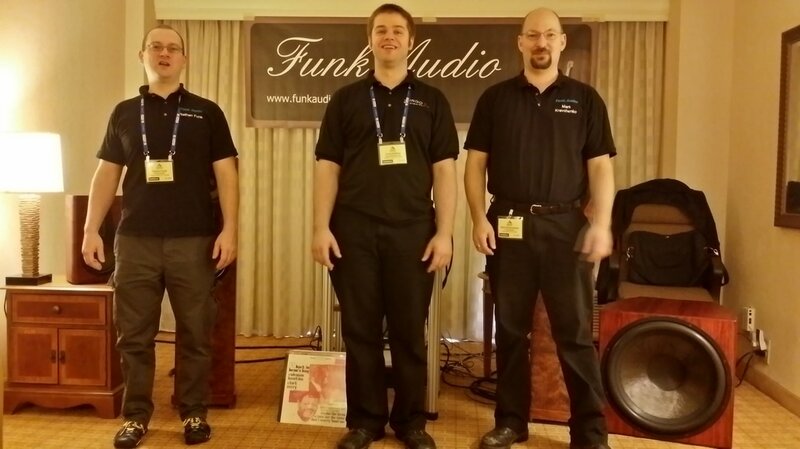 I attended and worked at two RMAF shows in Nathan's behalf and before and after the second occasion in 2014 Steve Tam and I designed and built the current Funk Audio website. I provide all the original photography and video work, along with all the advertising copy. Wrote the product manuals as well. Lot's of work! Two way design or Funk Audio. Faceplate closeup. Driver configuration and choice by myself. Crossover design by Al Wooley. Left is the finished product and right is the concept. 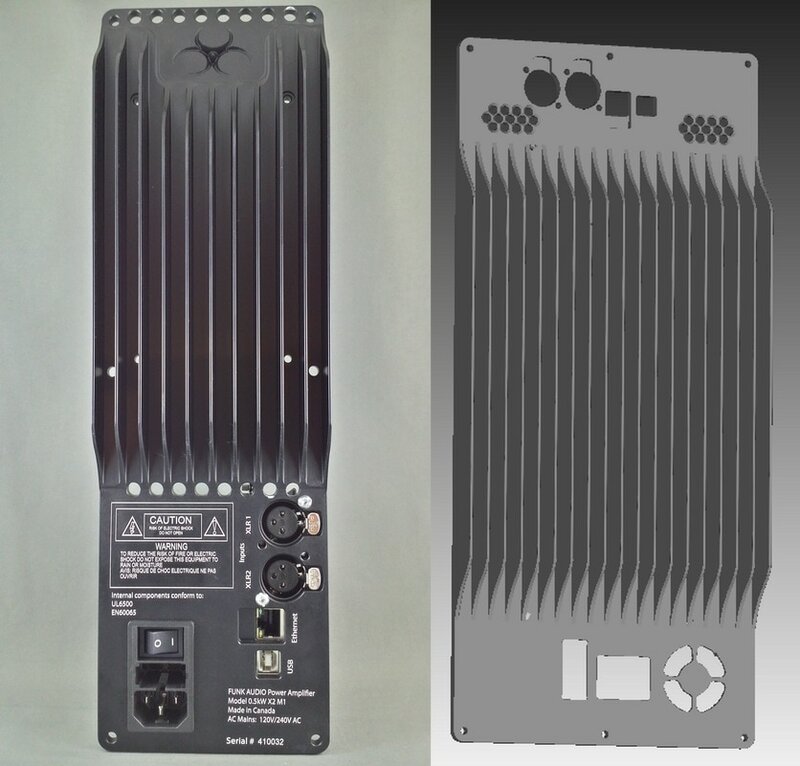 Dan FInley and I did the concept work in 2010-2011 for a prosound plate amp design. Large format front loaded horn system with face plate design. This was given to Jordy Wallace of Focus Machining and Design for fabrication. 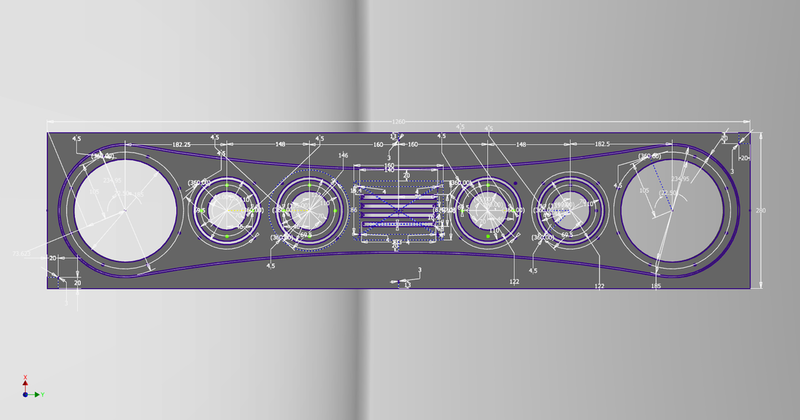 The multiple piece plate amp design when I first started consulting for Funk Audio. Notice the almost illegible writing. That was a process of going from scratch engraving by Jordy to the final laser engraved version. Laser engraved seems to give the best definition and legibility. A pic I took down the bore of the cooling ports on the TSADV2 motor. They are lined up with slots in between the magnets so there is a direct path for airflow. 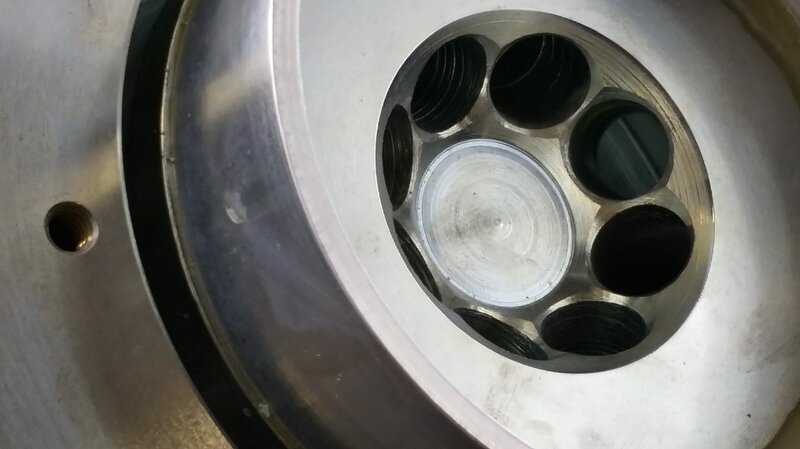 The dust cap acts like a piston and the air is pumped in and out of the motor in strategic positions as the cone is moved by the audio signal. This is a rendering done by Jordy Wallace of Focus Maching and Design. You get a different perspective of the previous photo in the cutaway view. 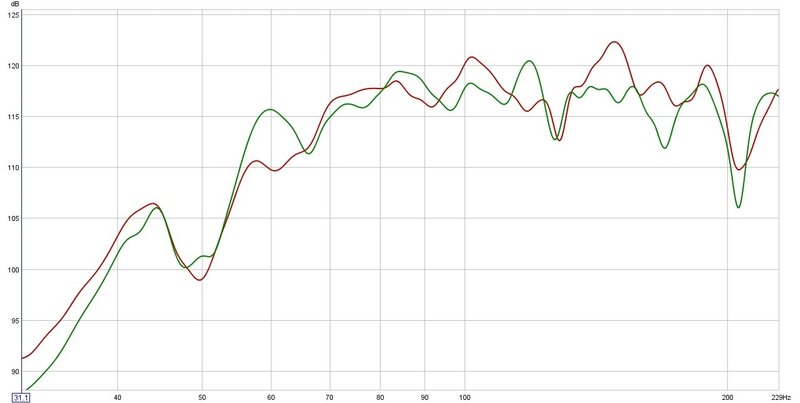 This is the MTM two way that is a complete Kravchenko Audio design. Photos taken in haste. No decent lighting. Hand held flood lights and the purchase of as many 40 watt florescent light bulbs as I could light up to get a decent photograph. A multi way design that was showed at the 2013 RMAF. It stole the show from the subwoofer we brought. We really didn't need it! We could match the output from an 18 subwoofer driver. But not the output from the dual 18 subwoofer driver. Fun to exhibit. This design stayed as a property of Kravchenko Audio. The current Funk Audio design that appears to be similar has two things in common. It utilizes the front plate and driver complement that I designed for. The dynamic bass potential is not even in the same ball park. Not in the state even! 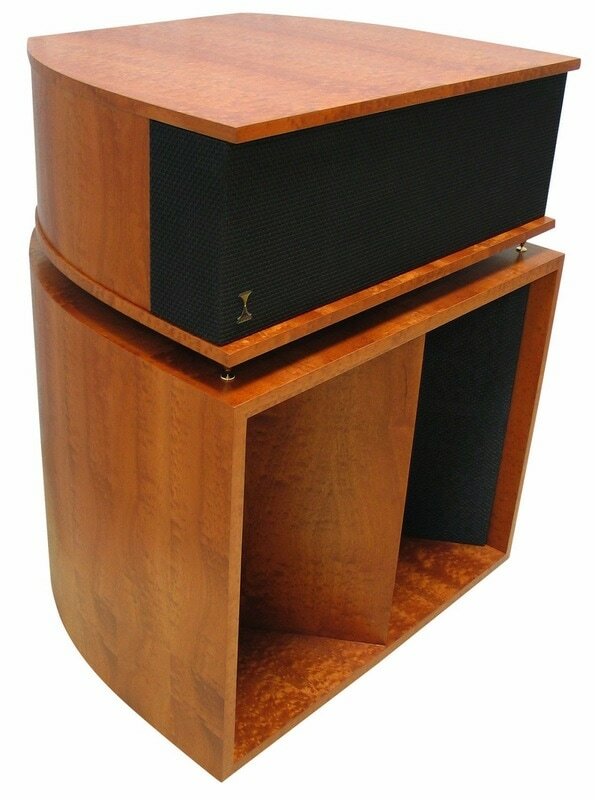 Greg Roberts was interested in producing a loudspeaker that was derived directly from the products designed by Paul Klipsch. He had a mid range horn patterned after the work done by Bruce Edgar and a high frequency horn all ready to go. What he did not have was something for the low end. He had no experience in measuring loudspeakers or in Horn design. He had ideas. Lot's of ideas. So to start with we set him up with a Woofer Tester from Smith and Larson and REW and a decent mic. And we spent the better part of 8 months going through each of his ideas carefully and painstakingly. I listened to the argument of "You mean to say that Paul Klipsch did it this way and it's wrong?" My answer was yes, wrong in the sense that Paul Klipsch did not have the luxury of simulation programs designed by people that were very interested in horn reproduction. I spent much time proving which design choices could work and ones that would lead to no particular efficacy. Greg ended up calling the loudspeaker the Vittora. It is a very short, resonant system. Think Horn/Bandpass implementation. We take a horn that is basically 34cm short for the desired horn Fc and trade that loss of length for a mass of air strategically placed in the horn path. 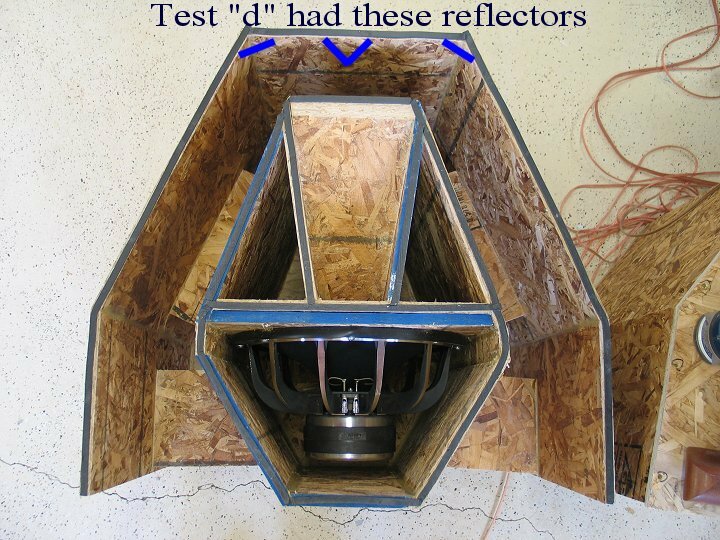 This allows us to fill in a hole in the response that would be present without the creative use of actual physics. Not bending, not defying the laws of physics. Actual application of real physics! So we took a horn not really long enough to be considered a true front loaded horn for the design goal and massaged it in the right places. A cleaner sound could have been had if the truly front loaded design was purued. That I have saved for the Klipsch Horn killer. A minimum horn path length for decent reinforcement ends up being a quarter wavelength of the lowest frequency you design the horn to reproduce. As an example the minimum useful length for reproducing 64 hertz in a horn is approximately four feet. The speed of sound at 20 degrees C is 343meters/second divided by 64 = 5.35 meters for one wavelength of 64 hertz. Now divide that by 4 you get 1.339 meters or 52 3/4" of required path length. 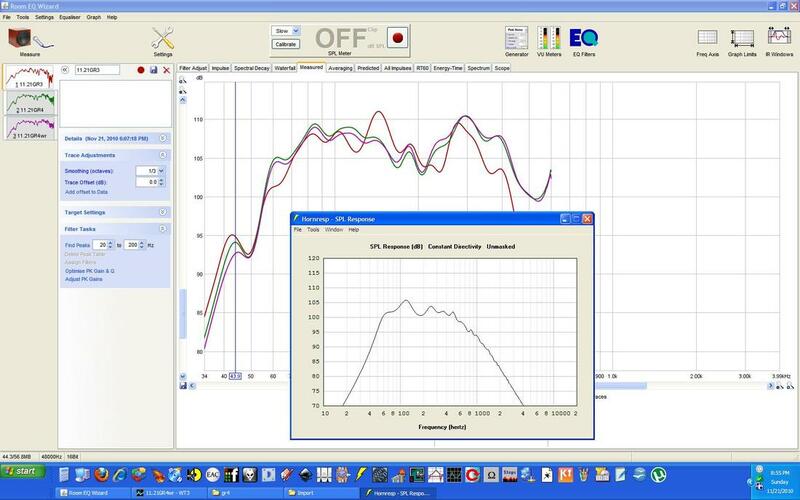 A shorter horn simply will not produce that low frequency with the same level of efficiency. But the current Vittora bass section it has it's benefits. Patterned after the ideas laid out in the Klipsch LaScala. After exhaustive set of measurements of the existing LaSala done by Greg I designed a horn path that was as efficient and considerably smoother in it's frequency response. We took an approach that was linked to providing maximum flat response out of a short horn. It provides much of the impact in music above 70 hertz and rapidly drops off below that. To complement the Vittora Greg wanted a subwoofer. So together we designed the ELF cabinet. He needed a driver, I came up with a good choice and then we had to integrate a port. That became a shelf port laid out along one wall again industrial design to the rescue. We also did a short lived wide-band enclosure that I designed for him in the raw simulation end and then suggested optimal cabinet dimensions. Some of the horn design work done for Greg. This is a comparative analysis of possible design changes early in the design process. So here we have Greg's measurement versus the simulation. THe simulation is the inset and the multi coloured lines are the measurents. Most of the differences turned out to be room reflections that we soon were able to figure out and pin point. All part of the art of making these things sing properly. Green trace is getting close to the final product. That is unsmoothed and really a very tight response window of plus or minus 1.5 db over the majority of the response window. We were trying to get rid of the peaks as measured in the red line. They were noticeable when listened to. 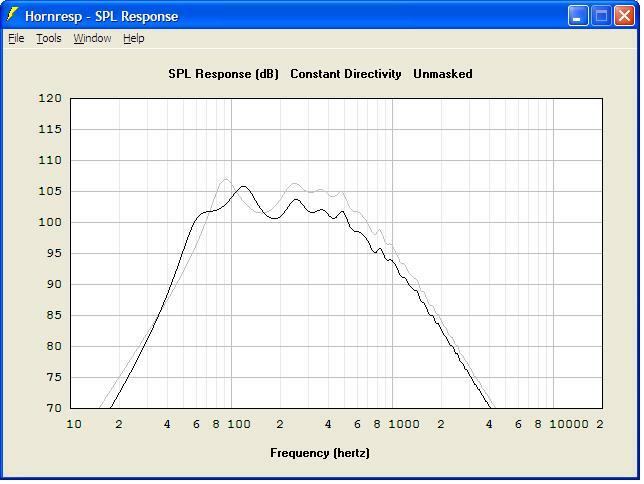 The green frequency response was judged much more neutral. No stones unturned. An earlier model prototype with a driver that we rejected in the end. But the point to the photo is that small changes at the correct position in a horn can have beneficial or detriment effects. Bifurication all the way to the beginning! And with no real audible benefit. One of my brainstorms that fizzled without much of a bang. But we tried! The things we do to wrap a long port in a short box! Same enclosure as seen from the bottom of the enclosure. 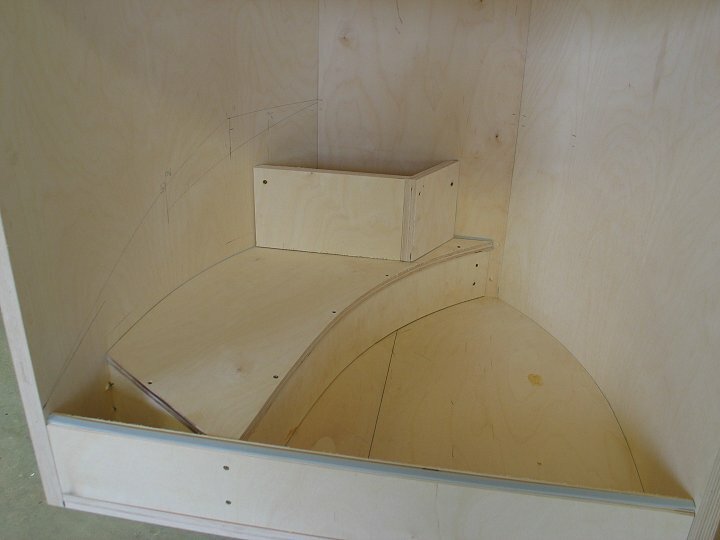 The file above is the horn used by Greg in his Vittora loudspeaker. It was a good design back in the 80's Using a driver that is now as rare as hen's teeth. It is possible to improve on this design greatly with more modern design simulation tools. And those advances have been put to application in the Klipsch Horn Killer design. 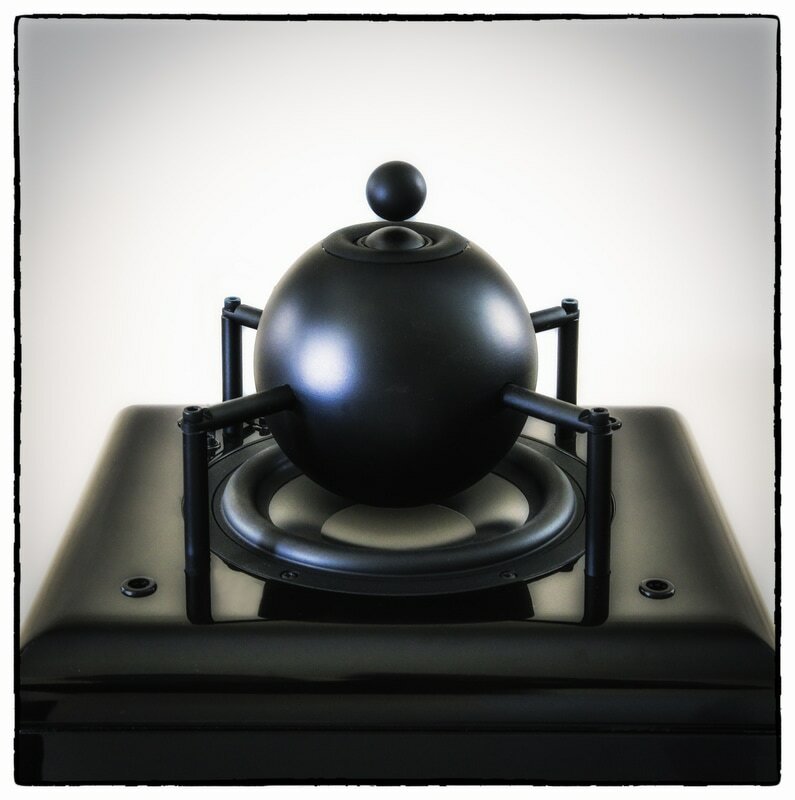 Morrison Audio is a very interesting company. 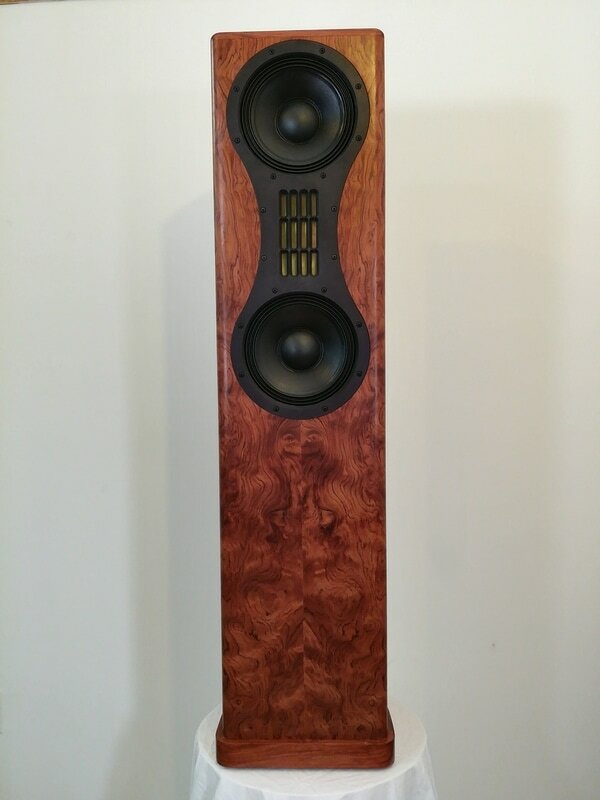 Don Morrison is a talented designer and purveyor of quality loudspeakers. He has built a continually refined loudspeaker since the late 70's. I came into the picture a few years back. OEM driver supply and design consultation with Don is a joy. He knows exactly what he wants. And he knows what to do with it! Don was looking for a better woofer. So we went about designing him a custom woofer specific to his requirements. You cannot always purchase an off the shelf driver to do what you might want to accomplish. Then I mentioned a tweeter that I was working on. A few shakes of a wombat's tail later, and he was sitting pretty with a set of drivers that have been a ear opener for both Don and his clientele. There are more developments afoot. A significantly improved woofer is about to see the light of day. 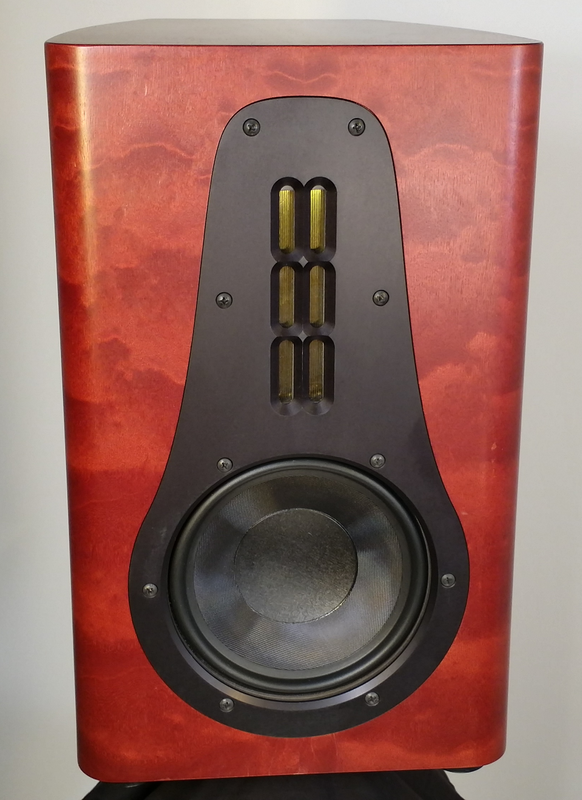 And there is a redesign of the loudspeaker thanks to the two of us putting our heads together for some actual serious improvement in the midrange reproduction. This has been a great partnership for the past 6 years and will be to come. 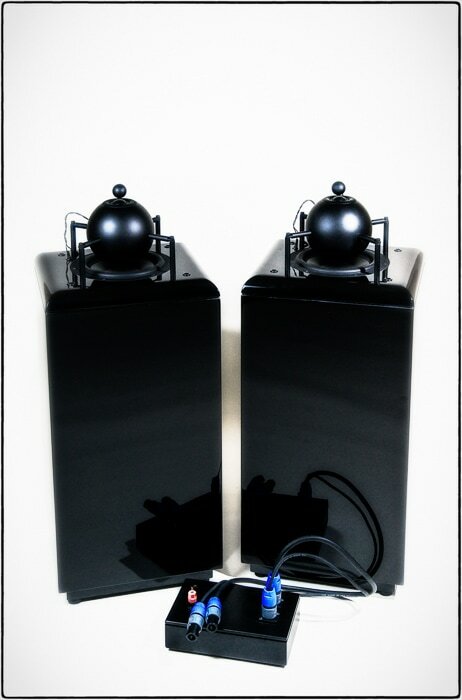 The Morrison Audio Omni directional loudspeakers. OEM versions of our 7 inch woofer and our 28mm dome tweeter. Custom parameters for any who wants their own versions are available.